The best spot to get geared up ahead of the competition. How to gear up quickly in Fortnite Battle Royale, and find the hottest loot locations ahead of the competition. 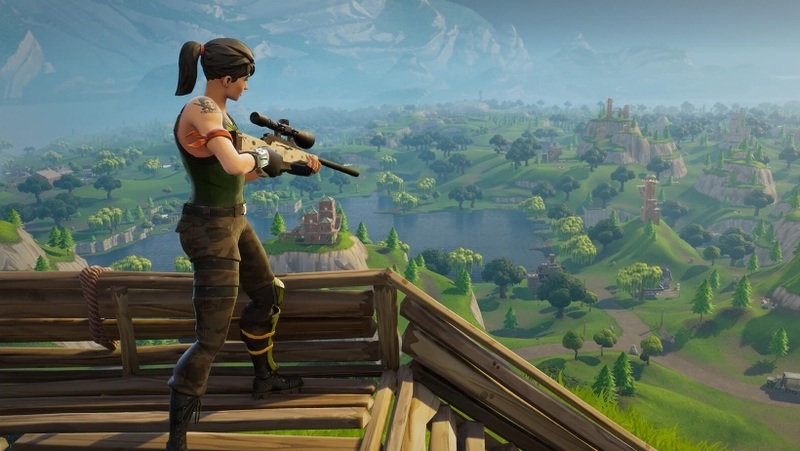 If you've been reading up on our Fortnite Battle Royale guide, have got to grips with the basics, and are now ready to start taking charge of your games, your main question is going to be how you go about getting loot fast and gear up quickly so you're ahead of the competition. Earlier on today we stumbled upon an incredible useful YouTube video which highlights a particularly strong opening gambit for gearing up. Of course, the more loot opportunities there are in any given area, the more competition you're likely to face on arrival. You'll have to move fast to win this survival race, but if you can get armed up fast you'll rack up some quick early kills. Here's the whole video. We've summarised a little bit of it just after the video itself, but you'll need to watch the entire thing for a proper understanding of what drops and where - things certainly get more complex once you have to start smashing down walls and building stairs! - The recommended starting location for gearing up quickly in the game is Retail Row, which is the large settlement located just over to the east of Loot Lake on the map. It's not the only spot, of course, so make sure you check out our article on the best places to land once you're done with the rest of this article! - When you arrive it's absolutely vital that you grab a gun - any gun - immediately, because this is a very popular place to start gearing up. You'll find good starting weapons either on the rooftops here, or in the basketball courts nearby. - If you don't have any luck getting a weapon outside, head inside to the biggest building that's directly opposite the basketball court. There should be something serviceable in here that will afford you some kind of protection while you begin your scavenger hunt. - Before heading into the back area, check the upper balcony inside to see if there are any gun spawns up there. In the back room, check the top of the shelves as a chest will often spawn in this location. Bust your way outside once you're done and take a look inside the rear of the truck too - there's sometimes another chest in there as well. - Open the nearby doors, loot everything you see in the outbuildings to the rear, and then make your way back outside to the main forecourt of the retail park. - In the nearby generator room you should be able to hoover up a few other items, such as ammunition and bandages. At this point you should have enough equipment to handily dispatch any enemies who have started lurking around the area. If you're not sure which weapon in the game is best to keep, check out our weapons tier list with stats - we've got every gun and rocket launcher in the game covered. That takes you to around the halfway mark of the video, after which point it's a question of smashing through walls and building new stairways to new areas, while dealing with any other players who have had the same idea as you. That's much more easily explained in video format, so make sure you watch the whole thing embedded further up the page, and give the creator a thumbs-up if you found this information useful. Consider subscribing as well to keep up to date with all of the latest Fortnite Battle Royale video guides!